A longer life or a better one? 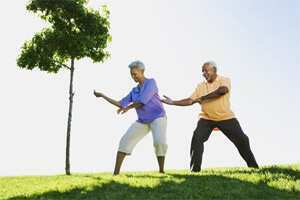 A senior couple doing Tai Chi. At the same time that the world celebrates, with trepidation, the 7 billionth person on the planet, scientists have come one step closer to perhaps prolonging human life. In this week’s issue of Nature, Japanese scientists have published a new study saying that they have managed to create a mouse pituitary gland from scratch. The gland, found at the base of the brain in humans and animals, secretes hormones necessary for proper functioning of the human body. To confirm their achievement the researchers then transplanted the gland into mice with a malfunctioning pituitary gland. Amazingly, the synthetic organ kicked in and restored the levels of hormones. The scientists say that in another three years they will be able to synthesize human pituitary tissue. The prospects for human health and longevity are tantalizing. Timelines will always be elusive in such science, but a future where patients can receive organs generated from their own stem cells seems feasible. Good news for mankind. Not-so-good news for the planet. Already heaving under the pressures of population growth, how will the planet cope with not just more people, but more people who will live longer? Over the last century average human life expectancy has almost doubled from around 35 to 70. And while life spans continue to seldom extend beyond 90, there is no reason to believe that this figure will not increase in the future. The implications of this on the planet’s resources and sustainability are troubling. A report released this week by the International Energy Agency (IEA) sounds dire warnings. It says that global coal consumption will boom by 65% in the next 26 years to overtake the somewhat cleaner oil. Unless drastic measures are taken in the next five years, IEA warns of irreversible climate change. If the science to prolong human life trumps the science to make life more sustainable, the victory will be pyrrhic.